Pernah punya cita-cita menjadi penulis? Atau malah sudah berhasil menjadi penulis dan menerbitkan buku? Saya juga pengen, malah punya keinginan untuk menulis serius dan menggelontorkan buku karya sendiri yang benar-benar saya suka. Tapi sampai sekarang, masih banyak alasaaaan yang menghalangi saya memenuhi keinginan yang satu ini. Mulai dari waktu yang terbatas (tapi untuk mantengin sale dan online shop masih bisa >_<), distraksi, sampai pekerjaan kantor yang hobi banget 'mampir' macam abang bakso kesayangan di kompleks kami dulu. Walhasil, saya mencari akal dengan mencoba membuat tulisan pendek dan mengikuti kontes blog yang salah satu hadiahnya adalah menerbitkan hasil tulisan kita dalam sebuh buku. Dan di salah satu kontes inilah saya pertama kali kenal mba Diah Dwi Arti. Time to meet my writer-buddy, Diah Dwi Arti. 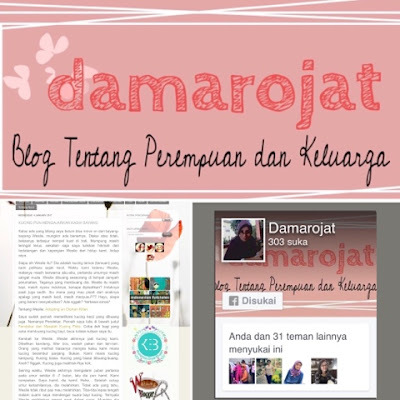 Continuing our 'arisan blog', or our blog-hoping and linky party, this time I get a chance to introduce my dear friend, Diah, a mom of two, Damar and Darojat. Two precious children whose names are shortened to be her famous blog, damarojat.com. As I previously mentioned above, we 'met' firstly in Pakdhe Abdul Cholik's contest about mother. Both of our stories, together with many others, were published in the same book titile Hati Seluas Samudera. We both talked about how deeply thankful we all are to our moms. For me who have spent so much time away from my mom, it felt like pouring my heart out missing her :). But, back to damarojat.com, on her blog, she talks a lot things that matter to her family and her readers. I truly enjoy reading her piece on kids and everything around them. 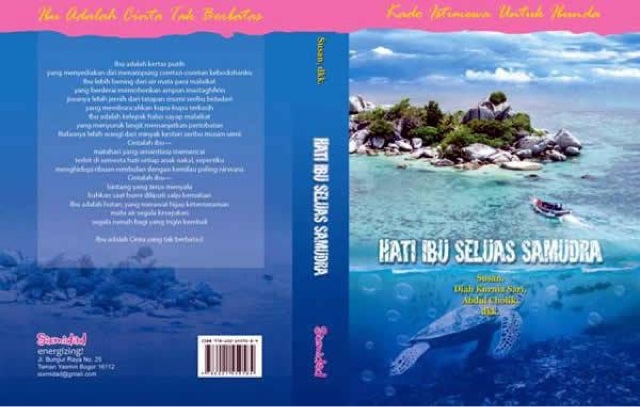 And she also writes a lot about her travel with her kids and family, including the most recent trip to Madiun to try 'river-tubing'. It certainly looks fun and feels like I want to try it as well! Her personal touch is her signature, as she shares many aspects of her personal life without patronizing. We can surely take some lessons of life from her reflection on many simple but meaningful things. One recent post that she wrote was about her cat, which, sadly, has died not too long ago. Here she wrote about how cats and kittens teach us to be patient and compassion towards others. She also once shared about blogging, the trend of social media and what will happen afterwards! There are some vantage points for us all here. All those stories are just simply flowing and full of good messages as well as points to ponder. Not to mention her other books and anthology! She won some blog contests, wrote for rockingmama.co.id, contributed to indonesianfolktales.com, and so many more! I really envy her and I hope I can follow her path in blogging and writing. Although most of her posts are in Bahasa Indonesia, do you know that she has another website dedicated to her stories in English as well? Yuuup... go check http://mommysnextstep.blogspot.com and get to know more of Diah Dwi Arti. She also have another blog filled with her fictions called hari-hari fiksi and one in Javanese, the traditional language of Java people. Thumbs up, Mba Diah :). You surely are serious in blogging and preserving Indonesian intangible heritages like traditional language and folktales. Ini yang saya suka dari arisan blog. Kita akan selalu belajar mengenai hal baru dan mendapat inspirasi dari teman-teman di dunia blogging. Apa kabar Mba Indah ? Wuiihh, aku belum setor ini buat mba Diah. Ah senangnya bisa kenal mba2 yang luar biasa dari arisan kita. It's nice to connect with other bloggers who share our interests. I have so many friends I met through blogging that I would love to meet in person some day. I love my blogger friends. You guys probably know more of my life then my friends outside of blogging. They don't read my blog I don't think. I send the address every year on a postcard at Christmas time though. More blogger friends, the better..